The 700 Summeridge Towns at 700 Summeridge Drive in the city of Vaughan is a common element town complex with a total of thirty two towns that are all two floors in height. The 700 Summeridge Towns at 700 Summeridge Drive in the city of Vaughan were developed and built with construction completed in 2009 and having a private single car garage and a second parking space on the private driveway. The types of towns available at the 700 Summeridge Towns at 700 Summerdige Drive in the city of Vaughan include three bedrooms with two full bathrooms and a powder room, as well as four bedrooms with two full bathrooms and a powder room. The sizes of the towns at the 700 Summeridge Towns at 700 Summeridge Drive in the city of Vaughan range from approximately one thousand and six hundred square feet and up to just over two thousand and two hundred square feet. There are no amenities for the 700 Summeridge Towns at 700 Summeridge Drive in the city of Vaughan as there is no condo building attached to the towns except for visitor parking for the owners guests. There is a monthly maintenance fees for the towns of approximately one hundred and fifty dollars which covers the parking charges and common elements including snow removal and garbage removal at your door. The owners own the entire unit including all the structure of the unit and pay for all repairs interior and exterior as well as heating, central air conditioning, water, electricity, home telephone, internet, cable television, as well as insurance on their own belongings and insurance on the entire home. The 700 Summeridge Towns at 700 Summeridge Drive in the city of Vaughan is located just north of Highway 7 and Highway 407 ETR and on the east side of Dufferin Street in the Thornhill and Maple areas of Vaughan. The 700 Summeridge Towns at 700 Summeridge Drive in the city of Vaughan are close to all major amenities including indoor malls, retail shops, grocery stores, parks, hospitals, major highways and public transprotation routes. The closest indoor malls for the residents of the towns include Promenade Mall to the south on Bathurst Street, the Vaughan Mills Shopping Centre to the west along Rutherford Road and Hillcrest Mall to the east on Rutherford Road. The closest grocery stores to the owners and tenants of the towns include No Frills, Sobey's, Longo's, Walmart and Costco all within a short drive of the towns. The closest parks for the 700 Summeridge Towns at 700 Summeridge Drive in the city of Vaughan include many smaller parks in the area behind the schools as well as Sugarbush Heritage Park to the east on Bathurst Street. The major medical needs of the neighbourhood are service by two hospitals and include York Central Hospital to the northeast on Major Mackenzie Drive, as well as North York General Hosptial to the southeast at Highway 401 and Leslie Street. The public transportation routes available to the 700 Summeridge Towns at 700 Summeridge Drive in the city of Vaughan include the York Region Transit buses at your doorstep which can take you to the Finch Subway Station and the underground subway. The closest major highways to the resdients of the towns include Highway 7 and Highway 407 ETR to the south which can take you east to Highway 404/Don Valley Parkway or west to Highway 400. 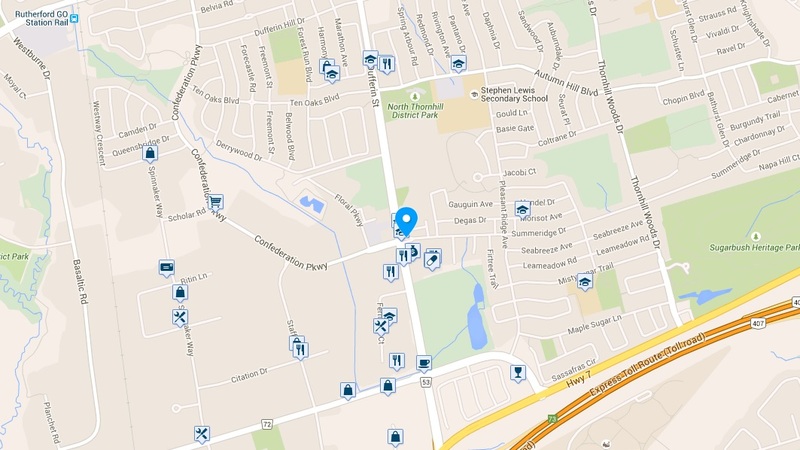 Click on the map to view the full walkscore on the 700 Summeridge Towns at 700 Summeridge Drive in the city of Vaughan for more information on the area including shops, stores, restaurants, bars and cafes. I have researched and put together a list of the Public Schools and Catholic Schools that are associated with the common element towns at the 700 Summeridge Towns at 700 Summeridge Drive in Vaughan. I have also researched and listed the closest Montessori Schools and Private Schools to the common element towns at the 700 Summeridge Towns at 700 Summeridge Drive in Vaughan. Click the school name for the school website, click the boundary link for the school boundaries and click the ranking for the Fraser Institute School Ranking and EQAO Scores. I have also researched and put together a list of the closest day cares from GoDayCare.com to the common element towns at the 700 Summeridge Towns at 700 Summeridge Drive in the city of Vaughan. Call the day cares for more information on the programming offered, the pricing for the programming and any spaces available.